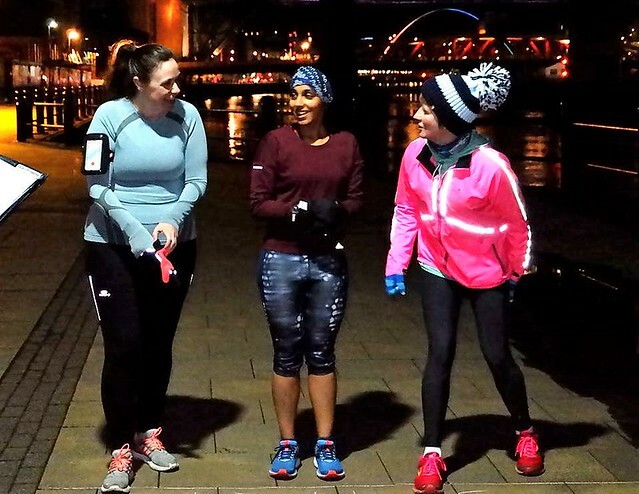 Congratulations to race winner Heather Steel and Hazel Juggins on winning the Winter Cup on a very cold night at the Quayside. It is good to see Heather getting back to her best and starting to good times again, but I think having time off to become a Mum is a pretty extreme method of beating the handicapper! Heather was a full 30 seconds ahead of second placed Maddie Day who herself had a good lead over Kenny McCormick. The rest of the 43 runners came in thick and fast over the next couple of minutes. Fastest on the night in 23:05 was Jason Hall – though some credit must go to Jonny Evans who sacrificed his own run to act as Jason’s pacemaker. Daniel Mourenza was second fastest in 23:55, whilst Marius Skaisgirys showed what he is capable of with an impressive time of 25:18 – demonstrating that he just comes for a slow jog on Monday nights! Fourth fastest, and fastest lady, was Catherine Young. Catherine consolidated her position as the 3rd fastest female in the history of Claremont running this course, improving her time to 25:40. Just imagine what she could do if she declined Roberto’s offers to run 10K with him before the start! Sarah Kerr and Maddie Day were 2nd and 3rd fastest ladies in times of 26:19 and 27:47. Special thanks to all marshals, time keepers and volunteers for standing in the freezing cold so that the rest of us could enjoy a run. Thanks to Dave Manners and Mungai for the photos which are now on our Flickr feed.